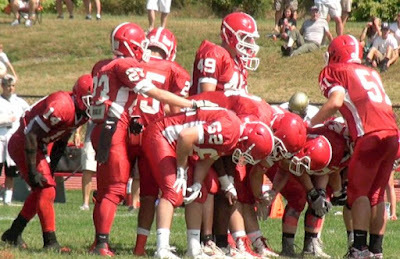 Though it came in with plenty of holes to fill, the St. John's defense impressed on opening weekend, holding powerful Shepherd Hill to a single touchdown. It was a thrilling opening weekend of high school football in Central Massachusetts, as perennial powers clashed, contenders scored significant early season wins, and small-school powers flexed their muscles. So, who's rising and who's falling this week? Find out below. By Joe Parello (@HerewegoJoe)So, let's get right to this week's Power Rankings. Ed. Note: Last week we only ranked the Top-5 teams in Central Mass, then listed an "In the Running" category. Now that the season is underway, we're opening our rankings up and doing a complete Top-10 list. Last Week: Ranked No. 1, defeated North Middlesex 42-8. The Blue Devils started the season in dominant fashion, smashing an overmatched North Middlesex team behind four Noah Gray touchdown passes. Things will get much tougher next week when Leominster travels to Shepherd Hill. Last Week: Ranked No. 2, defeated No. 3 Shepherd Hill 19-8. The Pioneers overcame some early red zone woes to top fellow CMass power Shepherd Hill at home. Quarterback Tim Cassidy proved to be a threat with his arm and legs, and St. John's looked as strong as they ever have on both lines. A showdown at Eastern Mass power Central Catholic awaits St. John's next week. Last Week: Ranked No. 4, defeated Gardner 56-0. The Rams showed why they're prohibitive favorites again in D5 Central, blowing out Gardner and gearing up for a game against D5 contender Bartlett. Northbridge should be ready for the playoffs by the time they finish a schedule that includes all the D5 Central mainstays (Auburn, Uxbridge, Bartlett and Leicester), plus some interesting match ups with D4 contenders St. Peter-Marian and Grafton. Last Week: Ranked No. 3, lost to No. 2 St. John's 19-8. The Rams couldn't top St. John's on the road, but still showed their trademark physicality on both sides of the ball. New quarterback Ryan Wong-Li will only get better, and junior two-way lineman Alec Lindstrom appears to be just as tough and mean (in a good way) as his older brother, current Boston College freshman Chris Lindstrom, and dad, coach Chris Lindstrom Sr.
Coach Lindstrom described Saturday's game against the Pioneers as a Central Mass Bowl game, and the Rams have another one coming up this week when they host Leominster. Last Week: Ranked No. 5, defeated Shrewsbury 28-13. It was a show-me game for the senior-laden Guardians, and SPM did not disappoint, knocking off Division 2 Shrewsbury by double-digits. Running back Anthony Baldino led the way with a pair of touchdown runs, but this offense is as balanced as any in the region with senior quarterback Seamus Leary calling the signals. A tricky trip to Groton-Dunstable awaits the Guardians next week. Last Week: Unranked, defeated West Boylston 22-6. The Tigers have made back-to-back trips to Gillette Stadium for the Division 6 state championship game, winning the title in 2013, and fully asserted themselves as favorites once again in the state's small-school division. Between quarterback Connor Bassett and running back Griffin Shoemaker, Littleton has one of the most explosive and versatile backfields in the region. Next up is an interesting home date with a Maynard squad that just trounced D6 power Blackstone Valley Tech last week. After serving as a role player on Doherty's 2013 D4 state championship team, then emerging a bit last year, seniors Aaron Adu and Tavian Vassar are ready to be stars in their own right. Adu is the lightning to Vassar's thunder on offense, and Vassar is also one of the most feared defensive linemen in the region on the other side of the ball. Adu ran for a pair of touchdowns to draw the Highlanders even with Auburn after a 14-0 halftime hole, and Vassar powered his way in to win the game in overtime. Next up for Doherty is a trip to Holy Name. Even in defeat, Fitchburg turned heads across the state as the Red Raiders' defense nearly blanked state power Brockton. Offensively, there are some hills to fill around star running back Alex Marrero, but the trademark attitude and toughness appears to be there for Fitchburg, who lost a ton from last year's surprising Division 2 Central championship team. The schedule gets no easier, as a big date with Wachusett looms next week, followed by battles with St. John's and Shrewsbury. Last Week: Unranked, defeated Holy Name 37-20. The Mountaineers showed some explosiveness offensively against Holy Name this past weekend, led by Matt Russell's pair of touchdown runs and quarterback Brendan Desaultels touchdown pass. Wachusett and Fitchburg both seem to have earned "contender" status in D2, but next week's game in Fitchburg will give one an early inside track to a playoff spot. Last Week: Unranked, defeated Algonquin 12-7. The Chieftains are always a force to be reckoned with, but a "too close for comfort" win over Algonquin isn't what Nashoba was looking for to start the season. Nevertheless, the Cheiftain defense should again be one of the region's best, led by a talented linebacking group, and they did get the job done late in the game against the Tomahawks, a good sign for a team that figures to be in a bunch of close ones.